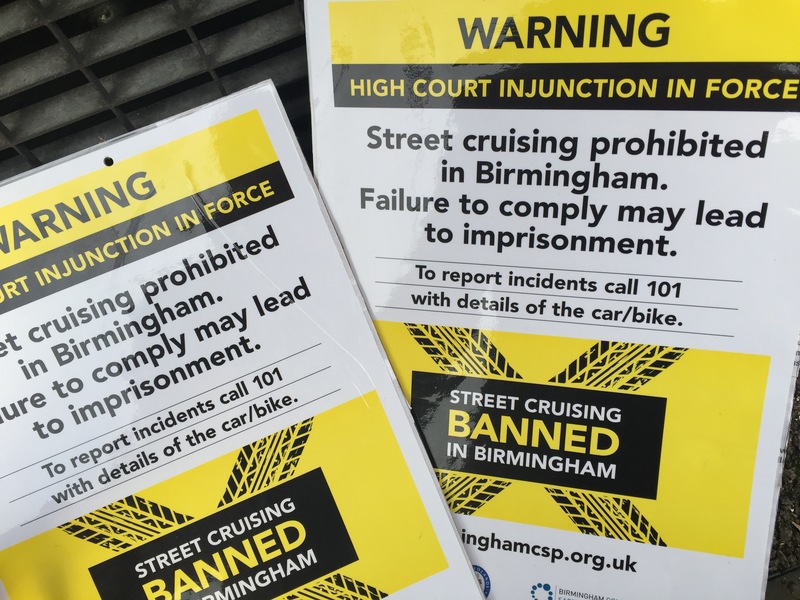 Police and the council went to the High Court to get the order which means drivers at rallies could end up in court. The Black Country did the same thing last year and, after rallies like the one on Halloween, Birmingham forces have worked to bring in to the city. On Halloween night, more than 200 motorbikes raced on roads and in parks in the the south and east of Birmingham. It spans the whole of the city and also covers wider anti-social motoring like riding in convoy, performing stunts, or revving engines, blaring horns and playing loud music at vehicle gatherings. Signs are being put up at the roadside on hotspot routes - including the A47 Fort Parkway, the A38, A45 and city centre 'Middleways' - while around 2,000 A3 posters will be popping up in petrol stations, shopping centres and football grounds warning of the injunction. West Midlands Police & Crime Commissioner David Jamieson, added: "I have made keeping our roads safe a key priority for West Midlands Police. "The overwhelming majority of road users are appalled by the actions of the dangerous and inconsiderate few. I am sure that they will welcome this strong action."